When Eileen’s mother found out she had Polycystic Kidney Disease (PKD) no one in the family had even heard of it. You can imagine Eileen’s surprise when she found out that PKD is one of the most common, life threatening genetic diseases, affecting thousands of Americans every year, and it ran in her family. In 1977, when Eileen’s mother’s kidneys failed, a transplant was not a viable option. She began home dialysis, and survived with kidney failure for two years. Of Eileen’s six siblings, four of them inherited PKD, including her. Eileen, however, did not learn she had inherited PKD until she was in her mid-forties. Prior to this discovery, she did not have health insurance that would cover an annual visit. Eventually, her husband and she received medical benefits from a new employment opportunity, and she figured it was time to check in on her kidneys, given her mother’s disease. After her primary care physician identified that Eileen had in fact inherited PKD, she was referred to a nephrologist, or kidney doctor, Richard Muther, MD, Medical Director of DCI Rockhill. From their first meeting Eileen and Dr. Muther worked together to maintain her kidney health, prevent kidney failure, and avoid dialysis. 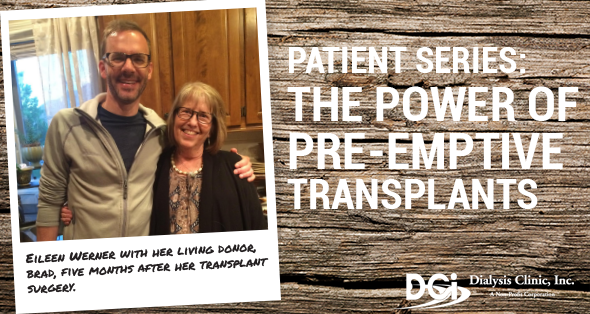 After 23 years of working together, Dr. Muther explained that Eileen’s kidney function was declining to the point that dialysis or a transplant was necessary. He said a transplant was the best treatment option for maintaining the quality of life she enjoyed. Eileen didn’t know if she would get a transplant before needing dialysis. However, a family friend, Brad, heard about Eileen’s need and decided to see if he was a match. The test revealed that Brad was a perfect match. On November 11, 2015, Eileen received her kidney transplant. Today, Eileen is enjoying life with her new kidney and the miracle of zero days on dialysis. Eileen shared that her older sister and brother have also had successful kidney transplants.